At the Orpheum Thursday, Canadian dubstep legend Zeds Dead, comprised of DC and Hooks, unleashed a cohesive mix of their signature sound while unveiling their debut album, Northern Lights. Before they went on, the night began in seemingly-perfect fashion as opener Hunter Siegel unleashed some upbeat, bass house tunes backdropped by a large white screen displaying his name. His easy-going persona and hard-hitting mixing ability provided the perfect transition into the other artists of the night. About 15 minutes into his set, things took an unexpected turn when the DJ unleashed violent, heavy-hitting dubstep on ravers for much of his performance. This much-appreciated turn culminated in more of his perfectly-majestic music, including his “Closer” remix. With his set, Illenium was able to demonstrate his versatility as a DJ and give Zeds Dead the perfect walk up song to begin their own performance. When DC and Hooks stepped onto the stage, the crowd erupted in explosive cheers. From the beginning, it was clear the duo wasn’t there to mess around with any of their more light-hearted house songs. 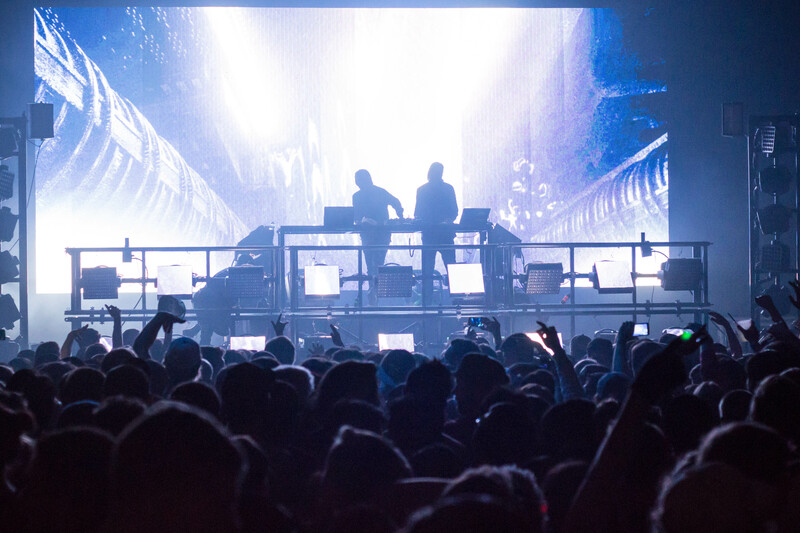 They unveiled volatile dubstep beats that melted faces and completely invigorated the Madison crowd into a dancing frenzy. At midnight, the dubstep legends stopped to announce the release of their first full-length album on their newly-formed label titled Deadbeats. Bearing witness to this moment allowed all listeners to truly comprehend the amount of effort that was put into the piece of art and was perhaps one of the most memorable moments a fan of their music could partake in. The Canadian duo perfectly blended classic favorites, such as “Rude Boy,” with their newly-created collaborations to conclude the night without leaving anyone disappointed. The show Thursday was not only inspirational, but it was a testament to the growing popularity of electronic dance music. Just three years ago, Zeds Dead may have had a tough time garnering a spot at the prominent Orpheum Theater or would have likely been confused with the widely-popular Zedd. But last week, they were able to sell out a show in Madison while also playing in Chicago, Milwaukee and Minneapolis. It’s clear they have garnered their positions as absolute elites of modern dance music.